A few months ago, I put together a little how-to worksheet on approaching landscape quilting. Most of it is based on my own personal process of developing and implementing an idea. A lot of it is my memories of what I wish I’d known when starting out. I still use it (or something more refined, yet similar) when I have an idea that needs more oomph or a glimmer of inspiration that requires more systematic thinking through. Thought I’d post it here, in case anyone else found it helpful. Parts one and three complete the series. There are actual lines in a piece (the horizon, a fence, a rooftop, a tall building, etc.) and there are implied lines (a river wending through a forest, a receding line of trees, a shoreline). Calmness is achieved through horizontal lines. This is accentuated through shaping the whole piece horizontally. Strength and power are shown through vertical lines. This is accentuated through shaping the piece vertically. Diagonal lines create a sense of movement, as can curved lines. Curved lines tend to create more varied, but more gentle movement. Diagonals tend to be quite dynamic. Even a calm piece can use an implied diagonal line to create visual interest and to make the eye move through the piece. What mood are you trying to convey and how can you use lines in your piece to convey it? Which way do you want the viewer’s eye to travel? Left to right? Right to left? Right, left and right again? Up? Colours not only create unity and contrast, but they convey mood, emotion and help to indicate proximity. What are the dominant colours in your piece going to be and how will you use accents to draw attention? Do you want the eye to travel into the distance in the piece (therefore requiring progressively lighter colours)? Do you want the focal point to be closer? Would colour choice help to achieve this? How big is your piece going to be? The Golden Mean (8:13 ratio) is a handy chart with which to decide on proportion. It is based on a very old calculation which seems to consistently give proportions which are pleasing to the eye. A piece 12” on one side would be 19.5” on another and vice versa, for instance (24”x39”, 18”x29.25” and so forth). Within the parameters of your piece, will your depicted objects look well-sized? A huge cliff in a small frame will look out of place. Think about how big your focal object will be. One of the blessings of quilting is that you get to work in three dimensions. Not only do you have the ability to use the tools that painters use (line, shape, colour, value, proportion, etc.) to create a feeling of dimensionality, but you can be a sculptor too. You can manipulate the fabric to actually make a bump or a ridge. Embellishment with embroidery, the addition of layers and even simple quilting lines can add physical depth to a visually deep piece. Thanks for this information, I’ve been wanting to try this for a long time but have been put off thinking it was just too complicated for me. Now that I’ve read some basics, I am ready to give it a shot and learn more. Thank youf or your inspiration. No problem! Glad the information was useful! I condensed some of the worksheets I use in workshops for this site and am delighted to find that they make sense to people. The hardest parts of landscape quilting are starting and getting over that awful hump in the middle where the whole thing looks wrong. Drop me a line if you need more help! My husband and I bought an unfinished home in VT and moved from our home of 27 yrs last year. We have been in the process of finishing it for over a year now. 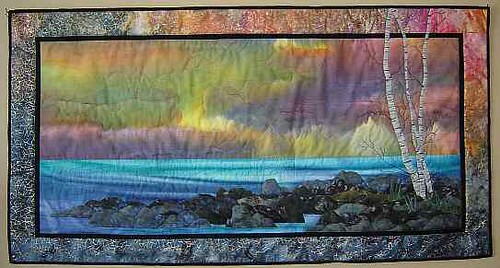 I am an avid quilter, but have always wanted to paint the landscapes of Northern NH and VT, but never got to it..I was surfing the TV on Sunday and found Sewing with Nancy. She was demonstrating Landscape Quilting and I was enthrawled and hooked..As soon as my husband and I finish the lower level which includes my sewing room I definately am getting started on Landscape Quilting..Forget the painting..This sounds like so much more fun..Thank you for the information on the, ‘How To’s’ of Landscape Quilting. Question: Is there a special glue you can use to secure these pieces or do you have to use fusible paper, wonder under, etc. ? Thanks so very much for getting me started. I use whatever the piece requires. Sometimes the layers are simply pinned until stitched, sometimes I use fusible and occasionally I use Jones Tones glue to attach items. Generally if I use any kind of adhesive, I also stitch. I don’t quite trust adhesives on the long term. I like Wonder Under for lightweight fusing that I’ll be stitch through quite a bit and find that Heat n Bond works great for heavier fusing. By heavier, I mean the result is very well-attached but the piece tends to be less flexible and somewhat stiffer. Best of luck with it! Let me know how you make out! I really enjoy your comments and information. I am relatively new at landscape quilting and feel I am making great progress working on my 4th quilt. My question is, recently I entered one of my quilts in our states Expo. I was excepted in the show, a great thrill for me however I did not place. The comment I recieved was that my tension was not consistant. So now I am very aware of my tension and sometimes I have a hard time when quilting over larger areas where the layers go from three to maybe five or six. How do you keep the tension of your quilting consistant? Have you found certain threads work better than others? Any help you can advise me with would be appreciated. Thank you! Vicki, I just stumbled onto your site and I am delighted. It is very well presented and very informative I am always in awe of other peoples’ art work. I liked your way of encouraging those of us who are too critical of our own attemts and too conscious of trying to create to please others. I needed to hear your gentle advise at this time in my life. Thank you, Vicki, for posting such a clear and encouraging discussion as well as inspirational quilting. I’m trying my first landscape for a purse for my sister. It will be a far cry from what you have done, but your comments here help me to see possibilities and to have lots of fun. I am a woodcarver and my wife is a quilter. She makes traditional quilts and has no background in ART type quilts to assist me. I have seen a few quilt programs on PBS. I have seen a few ART quilts and just have to try my hand at making one. I will take the advise you offer and see if I can make something that looks good for a wall hanging. I plan on cut and past for lack of better description of how I will make it. The picture will end up made of several layers as required. No endge embrodery but highlight sewing, embrodery and quilting to finish. Am I going in the right direction.